Today, I simply want to share some awesome horror with you guys. I haven’t even read it yet, but I’m always tantalized by the collection of short horror works the folks at Sirens Call magazine put out. This issue is all about eco-horror! Featuring 113 pages of Short Stories, Flash Fiction, & Poetry of tales describing what happens when Mother Nature fights back! 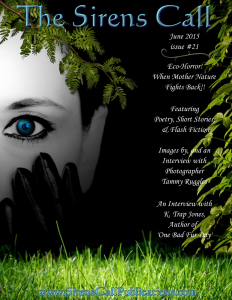 Images by, and an interview with, photographer Tammy Ruggles; plus an interview with K. Trap Jones, along with an excerpt from his book – One Bad Fur Day.